this cross-country trip is receding in my mind. it probably doesn’t matter, but in my mind were questions – i wanted to savor the moments of this journey but upon my return home, i hit the ground running causing the recent days to meld with the weeks and months before them like rain into the sea. i feel obliged to touch base with portland, oregon and make the run home. with it, i’ll mention things like the meteor shower going on this week, a post-midnight foray to fort tilden that happened tuesday and wednesday. floyd bennett field and fort tilden are the darkest spots in the metropolitan area and the go-to place for celestial happenings. i learned that last year. maxx ran his heart out on the beach while i scoured the heavens for the light show. i didn’t find it even when i found out where to look. 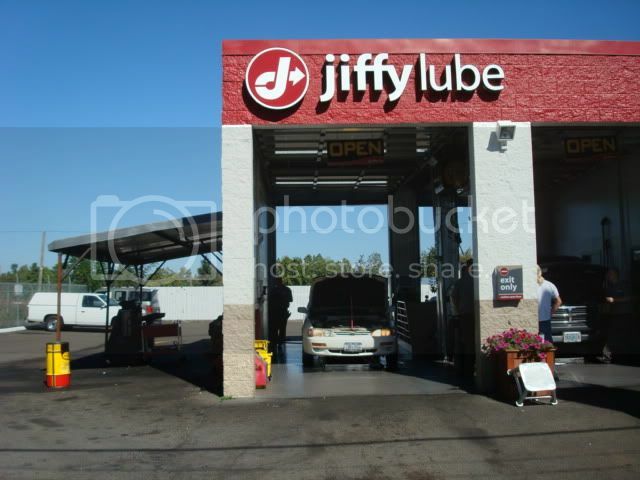 the first thing i did when i entered portland, was pull into a jiffy lube. 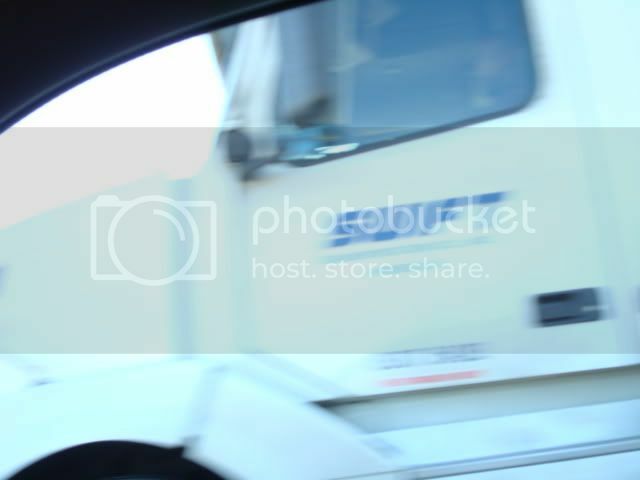 the above photo is all my portland pics. “hello, sir. have you come for our 19.95 oil change special?” said the young guy who greeted me when i got out of the car. i looked into my car and looked at the trip meter below the odometer. ” i drove three-thousand, seven hundred and sixty miles to be here now, for this oil change,” i said. i took maxx out of the car and they set to work. i took the photo you see above. the jiffy lube honcho with the clipboard approached me and told me things about my car i needed to know. i got a new air filter and windshield wipers. he told me that the car had no leaks and all of my levels were good. hooray. when your levels are good three-thousand miles from home, all’s right with the world. i texted my friend but got no answer. i have a friend i hadn’t seen since she moved out here four years ago. i was planning on visiting her the next day, sunday. about fifteen years earlier she was in an auto accident that broke her back and neck. she also shattered her leg like it was a plastercast sculpture. she wasn’t supposed to ever move, let alone walk, again. she, like my friend in the hospital here, was stubborn and battled back to health over a period of time. time. boy, you can really launch on about that as a subject, huh. we go back to scrap bar days, way in the beginning, like 1986.
for all i know, she and my friend in the hospital here sat at the bar on march 14th, 1988 and paid absolutely no attention to each other. they could have passed one another going to and from the bathroom, one brushing past the other. they could have been wearing black, chain-encrusted MC jackets, doc martens boots, black stockings and tight, black miniskirts. they might have muttered, “excuse me,” as they passed each other. i consider both of these people to be miracles. after speaking to my bionically-fused friend, we met for lunch at an outdoor burrito place where maxx would have barking sessions with any and all passing dogs. we met again that night and i was taken on a tour of downtown portland. she, i and maxx wandered around until my sciatica hollered at me. imagine that. a mass of nuts, bolts and screws, a fused neck and i’m bitchin’ and hobbling over muscle pain. i drove her home and we made arrangements to meet the next day. i went to my motel room and used my Broadband2go successfully for the first time. i received assistance from a tech who i suspected was speaking to me from bangalore, india. for moment, i thought about that. i decided that the american worker was going to hell in a handbasket and there wasn’t much i could do about it. the future….well, i’m not going to go there. sunday morning i would learn that my dear friend in the hospital was in supreme pain. she had already warned me that chances were slight to none that i’d be able to see her, something i figured would be the case and was prepared to accept without disappointment. throughout the trip, we communicated by e-mails and she even watched the “man versus food episode” at the same moment i did in butte, montana. she marvelled at the host’s ability to eat the five-pound mass of dough, cheeses, meats, veggies and sauce. i busted out laughing and think a small piece of pizza flew to parts unknown inside trimbo’s pizzeria. i would sleep deep in a motel room slightly outside of portland near the airport. i would wish and dream for miracles. when i woke sunday i received that text from my hospital-bound friend about being in horrible pain. i lost my appetite for brunch and spoke to my other friend tellin her that it may be time to head east. i decided that i would return to butte and spend a bit more time with there. 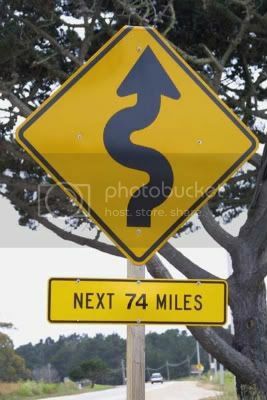 i would take the same highway east from portland then take US-Route 12 a secondary highway that i took for a while when i was making my way from glacier national park to oregon. 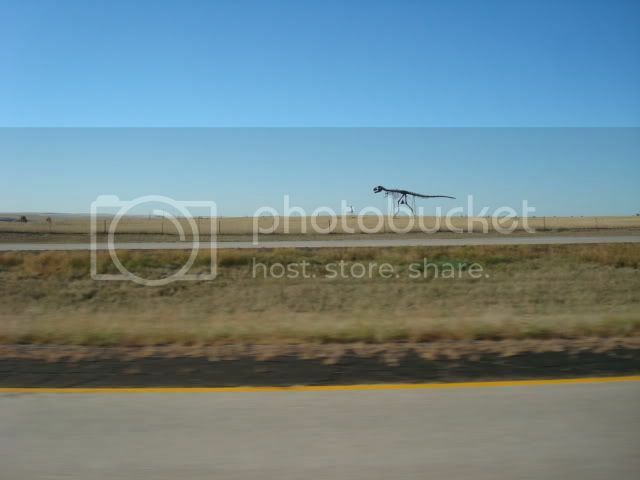 it went through walla walla, washington while driving route 12, west. i’ll tell you something else; US route 2, the highway i took from northern montana, was a beautiful road. i think it took me to spokane, washington. these two highways are the ones you’d want to drive if you want to “see” america. these highways themselves are art, from the road to the view. i would take US-12 east through idaho. a roadmap assured me that once i made it to missoula, montana i’d rediscover route 90 and that would bring me back to butte. the sun set. i was winding along this two-lane highway that snakes up and down the sides of mountains. it went on for what seemed hours until the road straightened. the cars that ran along with mine for the previous thirty or forty miles, exited off as the winding road signs began to appear again. it was night. – except it was dark and below it read “NEXT 99 MILES”. i pulled over, reached behind me to the cooler i had and pulled out an ice-cold manhattan special espresso soda. the stuff is loaded with caffeine and sugar. i had brought a case and a half with me. a case for my brother and half-case for my cooler. i was carrying the case in with me when i surprised the “Trimbo’s” clan days earlier. for the next two hours-plus, i wouldn’t see a car or truck in either direction. the sound of rushing water followed much of this journey. i pulled over to a rest/camping area to catch some zzzz’s. first i took a walk with maxx and found a stairway that lead to the rushing stream. the solitude, along with moon’s glimmer on my world in these moments begged the questions that wouldn’t take form until they “happened” in my mind. long ago, my cancerous journey, along with that of my friends, shattered the cathedrals of brick and mortar. serenity would be a fleeting condition on this mortal coil with no guarantees, with the next stage where the molecular and atomic will arc the time-expressway with nary a state trooper to worry about. standing still and glinting light-years-per-second while still managing to hold onto a nineteen-sixty-one snow-cone with cherry syrup and not drop a flake isn’t a tall order out there where i am, have been and will always be. i can reach into my friend’s hospital room, rest my warm hand on her chilly forehead and coo and whisper encouragement into seconds of strained tensions through tear ducts located in those fevered places the radiation cooked leaving devastation not visible to the nuclear microscope. you can do all sorts of things when you rejoin the atoms that made the universe. i do it all the time. i did it in the hush of this mountain night beside this rushing water amid these trees and silence and light and cold. i climbed into the back of the car and into the sleeping bag. maxx rolled himself into a ball and slept in the space provided behind my hunched legs, his head at my knee. i awoke after three hours and greeted the gray dawn with a desperate need to pee. as i attended to this, i would discover maxx had the same agenda. great minds…dot, dot, comma. we descended the stairs back to the stream i could barely see some hours earlier and i dipped my hands into the brrrrrr-cold water and and splashed my face with it. it was numbing. this is about as much a camper as i’ve ever been…ever. maxx stepped into the stream just enough to drink for a few moments. we quickly ascended the stairway and returned to the car. i found a towel, wiped my face and took out my travel toothbrush, spilled some water onto it from the gallon jug in the car and completed my ablutions. i decided not to shave. i considered these hours to have been closest to the realm of eternity. five minutes later i was getting breakfast at a burger king. that day i would grind out the miles and by noon be back at my brother’s in butte, montana. i would spend some hours sleeping, doing laundry and showering, then join the trimbo’s family for…pizza! my plan for testing the jumboli, the five-pound stromboli was tempered by age and understanding my limitations. the spirit’s willing……the flesh, not so much. i would not have heard from my friend since her text of pain and sadness two days earlier. i spent hours saying things in mantra, over and over again, never sure if it was a salve for her or me. in the end, i asked if it mattered. i decided it didn’t, reasoning it’s all connected. clean, refreshed and fed, i said goodbye again. i got a call from my friend tom, who’s father i met a few years earlier when he visited new york. he told me that his parents were expecting me for dinner in cedar falls, iowa on my way back east. i told him that i’d contact his dad as i neared that part of america. i said goodbye to my montana family, again with an array of slices of pizza in my car and headed east. i would have time to leisurely tour and visit another national park or monument, have dinner with tom’s folks and maybe visit a friend in pennsylvania. when my friend gets out of the hospital, we plan to tour america. instead of two weeks, i think two months would be the way to go. i could see america for a living. you might pass that on for me…..you know…to the stations…..i would do it in an old stationwagon with tinted widows and a large dog. wyoming would disappear quickly under the wheels of the old toyota. 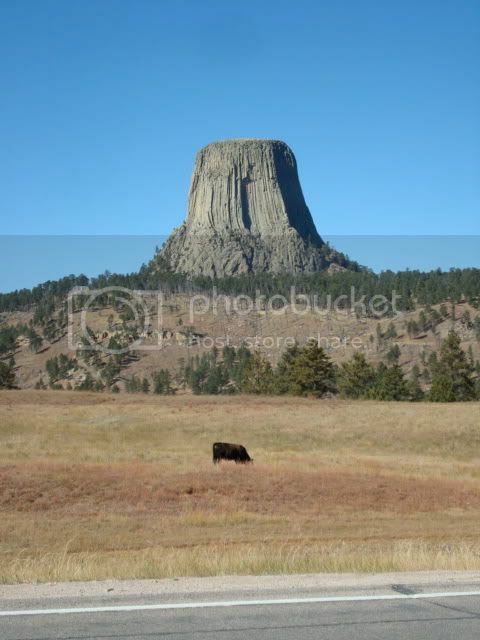 as i made it toward the eastern end of the state, i saw a sign for devils tower national monument and it’s not till this writing that it’s america’s first “national monument” and we have teddy roosevelt to thank for it. we thank you and stephen speilberg thanks you, too. a phrase i might use in describing an overbearing big galoot who barges into a private conversation. i had forgotten that this place was so close to the black hill national forest. a monolithic igneous intrusion in the middle of a hot, sunny afternoon? – i headed for the dakota border where i would find a scenic detour that would lead me into the forest periphery and then back onto the lead-in road back to route 90.
i got a kick out of that one…. i would drive across south dakota and sleep when i got to minnesota. i would make it to minnesota that night. i would be unable to find lodging for me and a giant dog and after a few tries, settled for an interstate rest area. i didn’t know it, but in around three hours, life would become interesting.